I moved to Illinois in 2000, and have been here ever since. Best thing I ever did. My husband and I have been here together for the last 8 years. We work in the same Industry Security & Building Materials. I have had the pleasure of being involved in the building development of many of the larger downtown high rises in Chicago. For example "Trump Towers", the newly renovated "Soldier Field", and Metropolitan Pier & Exposition. We have prospered very well. We have a little girl named Zoe who is going to be starting kindergarten real soon. We bought our 1st beautiful home in 2005. We live in the suburbs of Chicago, and are never really without much to do. In Memory of Brad Tockey, I love you man. You will always be missed. Denise Torres Boyd has a birthday today. Well this was me then as you all remember. 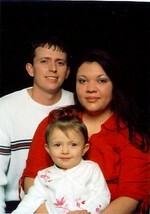 This is my family photo in 05! Me & Zoe after a nap. Gotta love the hair. My little fireball Zoe & her Shitzu Missy. Zoe at her Pre-School Program.